I say Internet, you say Internyet. The Russian government is getting ready to police its citizens’ Internet access, in a move aimed at controlling free speech within Russia. A new bill to be voted into a law will ensure that a “Russian Internet” will be filtered in ways the government decides. The Russian segment of the Internet will be regulated by the federal government of Russia. It would issue contracts on the control of the Internet. Currently, .ru and .рф domain names are regulated by the non-profit Coordination Center of the national domain of Internet, accrediting domain name registrars and oversees their registration rules. The proposed bill would also control all Internet traffic coming from other countries, obligating owners of all “autonomous systems” that exchange traffic with foreign networks to install special equipment for traffic control. The bill also establishes government control over all networks created by both individuals and judicial entities, obligating all users of such networks to register. For news coverage translated in English, click here. 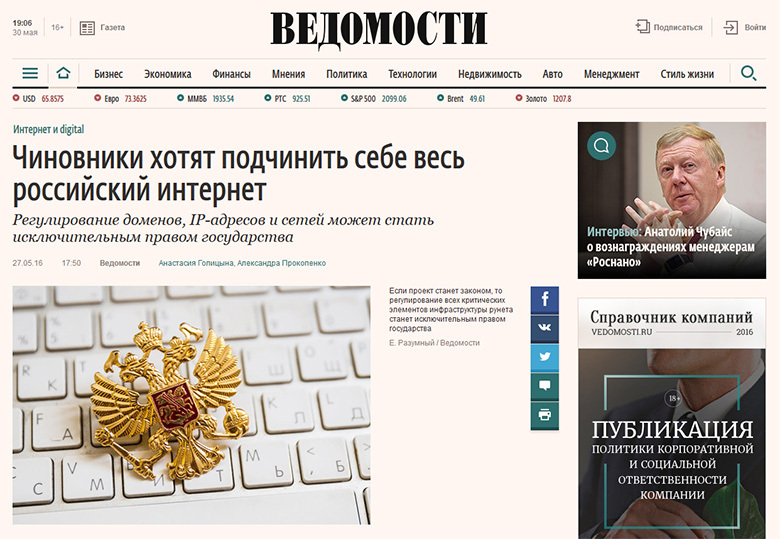 Russian newspaper Vedomosti broke the news about Russia’s intention to control Internet acccess. Eric – Great observation. Oligarchies, like Russia, and dictatorships like North Korea, have a lot in common. China is somewhere in the middle. Then there is Iran and its fundamentalism. Politicians want to control the masses of millions of people.